The January Cure: Where art thou, motivation? I mentioned in a couple of previous posts that I signed up for The January Cure hosted by Apartment Therapy for the first time. The idea behind it is to do a small, manageable assignment every week day (with larger tasks over the weekend) to refresh and organize your home for the new year. I was super excited about the idea of doing small tasks every day to clean and organize after the craziness of the holidays. I signed up in mid-December, and I was totally ready to go, but decided to just relax my way through the holidays and get going with the refresh on January 2nd, the first day of the Cure. I’m counting this one because I reorganized/cleaned up all of the drawers in the dresser in the guest room over the weekend. I got rid of a bunch of old papers I had in there and tidied up the drawers that house reusable bags and the guest towels. I reminded Korri that he has approximately 10,000 ESPN magazines living in there (he told me he has every single one since the beginning…). I didn’t do anything with them. It’s hard to declutter when half of the clutter is your partner’s clutter, ha! I would love for him to go through his stuff because I would like to move gift wrap stuff to one of the drawers. 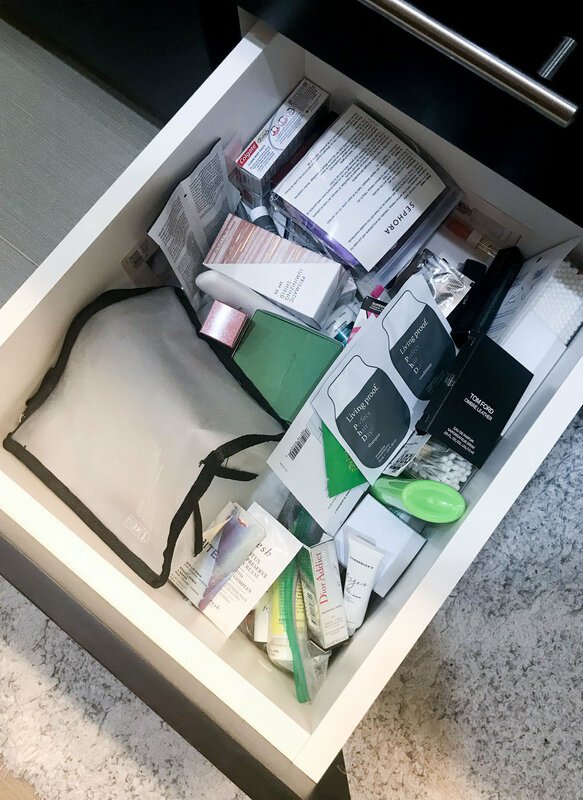 I decluttered one of the junk drawers in our kitchen (yes, we have more than one…working on that) and most of the drawers in our master bathroom and in the guest bathroom, so I’m not feeling too bad about the drawer situation. I need to reorganize one drawer in our master bathroom, and I should go through the drawers in the guest bathroom and declutter/reorganize/maybe add some drawer dividers for toiletries, but they really aren’t bad right now. This was the first weekend-long assignment, and it involved everything: tidying, clearing the surfaces, washing the sheets, flipping the mattress, washing the curtains, cleaning the windows and mirrors, dusting surfaces, cleaning the floors…and treating yourself to flowers. I didn’t buy flowers because Sybil would eat them. I only ended up doing a little bit of surface tidying before feeling completely overwhelmed. We flipped the mattress a couple of months ago, but I did wash our sheets and remake the bed. A couple of days before this assignment, Korri cleared out most of his side of the room, so at least that was done. We still have a lot more work to do in here, but it was still nice to crawl into fresh sheets on Sunday night! I currently have three boxes sitting in various spots around the house collecting items to donate. I will likely end up donating at least three more boxes of things once I go through everything of mine. Now I just need to actually finish going through everything and then DONATE those boxes! This assignment involves sitting in a room with no distractions or sounds and looking around, noticing everything from a different angle / seeing it from a new perspective. I didn’t do this one, and this one is on the back burner as far as the assignments go. This one is pretty self-explanatory, but, shocker: I didn’t do it. I was planning to tackle the upstairs coat closet (that also houses our vacuums), but there’s a bunch of Korri’s stuff in there that I knew I wouldn’t know what to do with. This goes back to my comment from Day 1’s assignment: it’s hard to declutter when half of the clutter is your partner’s clutter. I’m thinking I will need him to commit to doing the Cure with me in the future, and that’s not easy for me to convince him to do. This assignment involves walking around your living room and grabbing extra items (“visual clutter”) to store out of sight for a few weeks. The idea is to downsize the visual clutter in your space and revisit it later in the Cure. I might tackle this assignment after taking care of the Christmas decorations, but this will likely be another one that ends up on the back burner. This is the assignment for this upcoming weekend, so I’ll have to report back in my next update. You are to choose either the “outside” track (decluttering and cleaning every surface, including appliances) or the “inside” track (declutter the drawers and empty the fridge of expired items). I think I might tackle the outside track with Korri’s help. I cleared out our fridge a few weeks ago and it’s still in pretty good condition, and our cabinets aren’t overflowing with items (though some could be reorganized). I’m at around a 2.5/7 as of today (not including the kitchen assignment), so…not good. LOL. I’m hoping motivation will kick in soon so I don’t drag this on for the rest of the year. (I’m totally the type of person to do that.) I think one thing is clear, though: it’s really difficult to declutter a shared space when your partner isn’t decluttering with you and when you’re not sure what to do with your partner’s clutter! I may have to just create a box for Korri and stick stuff in it, lol. I’m not sure how he’d feel about that! Do you have any tips as to decluttering with a less-than-interested significant other? I strayed from my usual dark color palette in the winter for something on the lighter side. We’ve luckily had a few days of relatively warm weather for this time of year (the same thing happened around this time last year, too, though it was a few degrees warmer last year). When it’s not icy cold, wet, or snowy outside, I opt to wear flats or exposed ankles simply to mix it up and so I don’t feel tired of all of my socks and boots by the end of January when there’s still a month or so of winter left. I’m wearing another flannel Sunday shirt from Madewell. Are you surprised? ;) I’m obsessed with these shirts, and I own three of them now. I’m not usually one for multiples unless the garment is really good, so you know this one is good! I tucked in only half of the shirt to give it some shape. I don’t think I’ve ever tucked this way before because it is historically not my favorite look, but I didn’t really mind it here. I did a front tuck in this post and it felt a little bulky in front still. My boots match the subtle stripes in the shirt, which I love! I think subtle matching might be my favorite type of matching. How’s your January going so far? I haven’t been as productive as I wish I was (I’ll elaborate more in Friday’s post). I still have holiday decorations up and my house is still a mess. At least I’m going to work, though…and getting paid for it. (Korri is a federal employee currently “volunteering”—he’s still working but won’t be getting paid this week, unfortunately.) I’m trying not to freak out about paying the bills. I’ve been contacting our Senators and Representative regularly HOPING that they’ll come to some sort of agreement and open up the government. One can only hope! I’m trying not to dwell on it.